The Lim Hong Lap mansion can be found in Sibolga. It is a century-old traditional Chinese shop-house. It is a long journey of ten hours from Medan to Sibolga. In this journey, you drive by Lake Toba through the beautiful Batak highlands to Tarutung. From Tarutung you take the route which leads to the coast, along the road with a thousand curves, through the Bukit Barisan mountain range of Sumatra all the way to the coast of the Indian Ocean. In due course you see high from the mountains the city of Sibolga down on the coast. Sibolga, the small town where not so long ago, time seemed to stand still. Currently modernization also has swept this sleepy port town. This is evident in the increase of the burung walet (swallow) buildings for example. Sibolga has got quite some Dutch colonial houses, and there are whole rows of traditional Chinese ruko’s (rumah toko, or shop houses) with wooden shutters on the windows and a gallery downstairs. The House of Lim Hong Lap was built around 1900 by his father Lim Kim Cay. It is a traditional Chinese family house with curved roofs, a courtyard and two Buddhist altars with above these altars photographs of Lim Kim Cay, and wife, and Lim Hong Lap, the son who later inhabited the house. 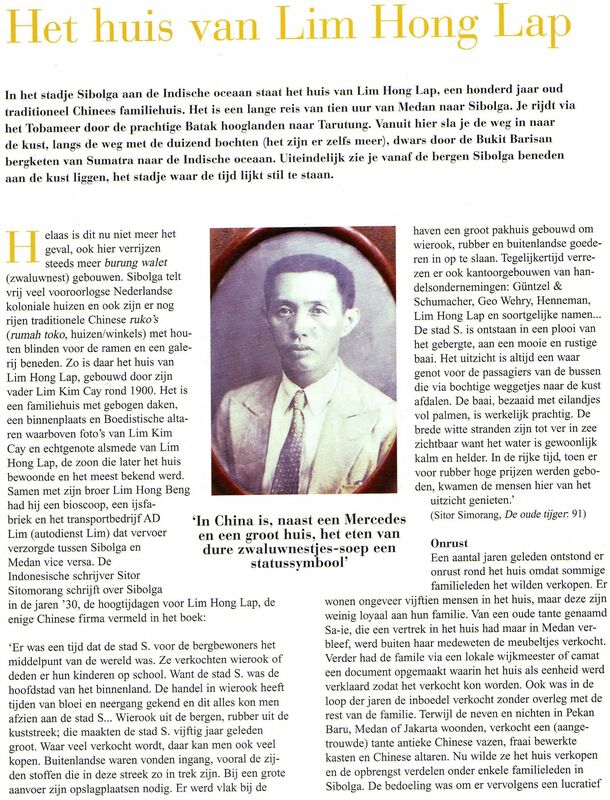 Lim Hong Lap had a cinema, an ice factory, and he was best known for his AD Lim (Lim car service) transport between Sibolga and Medan, and vice versa. There was a time when the city of S. for the mountain people was the center of the world. That was Sibolga in the nineteen thirties, and these were the heydays for Hong Lim Lap, the only Chinese company listed in the book. Currently, some family members are about to sell the ancestral home which is inhabited by about fifteen people. There was an aunt who had decided to stay in Medan, but kept a room in the house in Sibolga. The family in Sibolga however sold her furniture without her consent. This family also arranged for a document in which the house was declared as one unit, so that it could be sold through the Camat the local warden. Another aunt,who was an in-law, was behind this scheme and as a result she has earned the name name jual harta or the seller of the inheritance in the family. 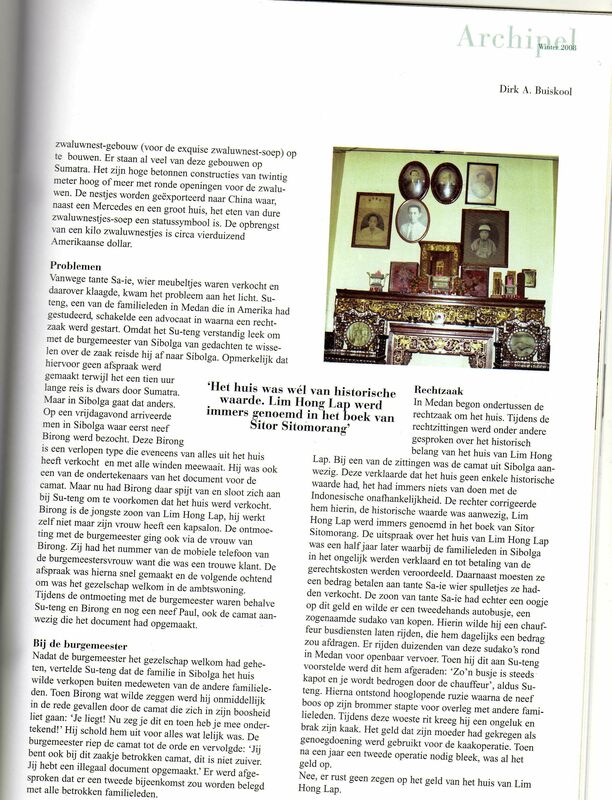 In this case, the inheritance of her husband.When the rest of the family was living in Medan, Pekan Baru or in Jakarta, this aunt has sold antique Chinese vases in the house, beautifully crafted cabinets and altars. At this point she wanted to sell the ancestral house, and divide the proceeds among some of her relatives in Sibolga. The intention was then to build a lucrative swallow nest building (as these buildings produce the highly sought after, and to some exquisite swallow nest soup). There are already plenty of these swallow nest sites anywhere in Sumatra. These are high concrete structures of around twenty meters tall with round holes for the swallows. Lately, on account of the Chinese economic growth, there have been more and more wealthy Chinese people, which has increased the demand for the swallow nests. For the Chinese nouveau riche, besides a Mercedes, and a big house, eating expensive swallow nest soup is also considered to be a symbol of status and wealth. These swallow nests are produced in countries such as Indonesia. The yield of one kilogram swallow nest is about four thousand US dollars, and that is not insignificant. The aunt who had her furniture thrown out into the street complained to the family, which alarmed them. A cousin, Su-teng, who had studied in the United States, hired a lawyer, and then started a lawsuit. Su-teng thought that it would be wise to discuss the matter of the house with the Mayor of Sibolga, therefore, he and some family members made the trip to Sibolga. There had been no agreement with the Mayor to meet, although it was a ten hour long trip. But matters in Sibolga work in a different way. On a Friday night they arrived in Sibolga and the first thing they did was paying Birong a visit. Birong is the youngest son of Hong Lim Lap, who also lives in the ancestral house. The business success of his father contrasts starkly with the business success of Birong. To make ends meet he rents out the small motor boat which he owns, but otherwise he does not undertake anything else. Birong was a bit of a rundown character who also had sold quite some things from the house, and did not have a very strong stance in the matter. It turned out that he was also one of the people who had signed the document for the Camat together with the aunt in-law. Now Birong has expressed his regret and joined Su-teng to prevent the selling of the house. That Friday during the sit down regarding the planning of the discussion with the Mayor about the ancestral house, Birong’s wife offered her help. Birong’s wife is a hairdresser and she knew the wife of the mayor well because she always came to her in the salon. She even had the Mayor wife’s number on her cell phone and called the wife of the mayor to speak about the house of Lim Hong Lim. Consequently, an appointment was made for the following morning at nine o’clock in the official residence of the mayor. Birong along with his wife joined. The Camat who had put up the document was also present. The Mayor welcomed them and asked where he could help. Subsequently, Su-teng began to inform him about the house and about the importance of the preservation of historical heritage. Then Birong had his turn. Birong had barely started speaking and the Camat started scolding him: “You’re lying, now you say that you do not want to sell the house, while before you did sign this document!” He called him a rotten fish. The mayor called the Camat to order: “Shut up you, stop!” And the mayor continued: “You are yourself involved in this thing Camat, this is not legal. You are involved in the making of this illegal document”. At the meeting it was agreed that there would be a second meeting with all the family members involved. In the meantime, the court-case regarding the house in Medan started. During the hearings, the historical importance of the house was also mentioned. During one of the hearings, the camat from Sibolga was present. He stated that the house had no historical value whatsoever, as it had no connection with Indonesia’s independence. The judge corrected him on this and stated that the historical importance was present, as Lim Hong Lap was mentioned in the book of Sitor Sitomorang. The verdict was pronounced half year later. The family in Sibolga was convicted and had to pay the court costs, additional to that they had to pay an amount to aunt Sa-ie for her belongings that they sold without her consent. Meanwhile, the son of Sa-ie was interested in the money as he wanted to purchase a second-hand transport minibus, a so called sudako. Sa-ie’s son believed that he could employ a driver on the minibus who would drive a certain route through town, and would pay him a daily profit. There are thousands of sudako’s in Medan as they are one of the means of public transportation. When he suggested this to Su-teng, Su-teng strongly disapproved. Consequently Su-teng said “such a minibus always breaks and you will be cheated by the driver” which led to a major quarrel. After the quarrel, Sa-ie’s son hopped onto his motorbike and speeded away in order to discuss with other family members. During this journey, he got into an accident which caused him to break his jaw. The money that his mother got as compensation was eventually used for his jaw operation. After a year, a second operation had to take place which required the rest of the compensational money. No, there is no blessing on the money of the house of Lim Hong Lap.